Residential and commercial property owners in Orland Park, IL, should be mindful of what to do in the case of a fire. There are many ways in which they can occur, and the risks to your property and belongings are substantial. At Rainbow International Restoration of South & West Suburbs, we provide fire damage restoration services to address all aspects of fires (including harmful smoke and soot) and return your property to its original condition. Our technicians are highly trained to handle any case of fire damage and they have all gone through a background check for your safety and protection. 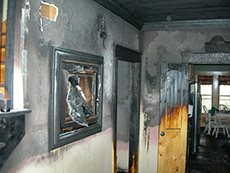 We can assist you on any scale and offer 24-hour availability to respond to fire damage. While the list goes on, the results are largely the same: your building and its contents are at risk of suffering permanent damage. Flames themselves can consume a number of materials, and then proceed to release corrosive smoke and soot that can damage other areas of your property. By responding with swift and effective cleaning and restoration procedures, we significantly reduce the extent of the damage. At Rainbow International Restoration of South & West Suburbs, we can begin our work as soon as fire department personnel extinguish the fire. We will first stabilize damaged structural elements of your property, and then begin our sanitization and restoration process. We have you covered from initial pre-cleaning through the repair of significantly damaged areas. If you aren’t sure if you should file an insurance claim for the damage, our technicians can advise you on the best way to handle this after we have fully inspected the damage. If you do decide to file a claim, we provide direct billing and will send the bill to your insurance carrier to cover the cost of the claim. Take pictures of the damage done to your property and belongings. We will take an inventory of your damaged belongings and provide you with multiple copies for your records and insurance claim. Responding to a fire can be as stressful as it is chaotic. At Rainbow International Restoration of South & West Suburbs, we do everything possible to give you greater peace of mind through our fire damage restoration services. We even offer a price match guarantee in which we will meet or beat competitive proposals that are also in line with the IICRC’s standard of care. To learn more, or to leverage our 24/7 emergency-response services, give us a call at (708) 571-2550. We proudly service those in need in Orland Park, IL.